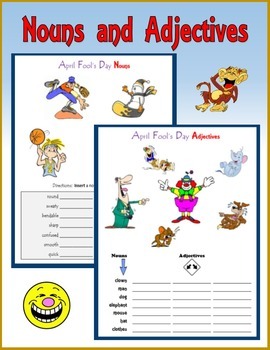 Celebrate April Fools' Day with Noun and Adjective activities. 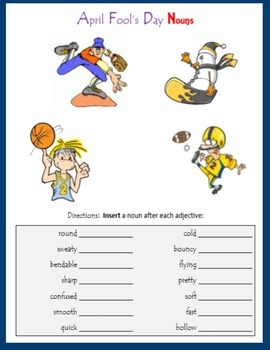 10 printable pages for students to write nouns or adjectives. 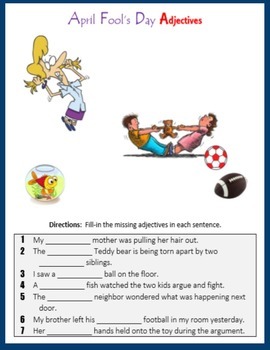 Students use the picture at the top of the page to help them think of nouns that match the adjectives or adjectives that match the nouns on the page. 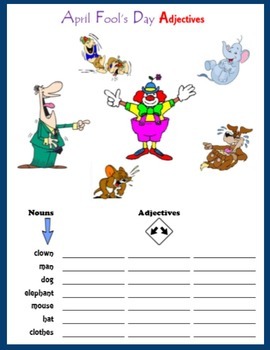 Students will laugh at the funny pictures: laughing animals, an alien in a spaceship, a dog chewing up homework, an ant playing a violin, a chicken doing the chicken dance, a snowman snowboarding, and more funny pictures. Take a look at the Preview to see samples from this packet.